UV-5RA radio from Baofeng. I can’t say enough good things about this little radio! This radio is compact, battery charge lasts a very long time, versatile, and so far it is proving itself to be very durable. The downside? Yeah, made in China. FYI…I spent about $130 for the radio ($25+/-) and all the accessories (including programing software) to make this radio really work in every aspect for me. This is a true bargain in every sense of the word. This radio, as I have outfitted it with accessories, goes very long way towards overcoming communications issues during emergencies and disasters. When it comes to “grid-down” I believe this little beauty will make a life-betting difference. One of the highest priorities in any emergency or disaster (yes, including “grid-down”) is the ability to communicate. And this sweet little radio is fully programmable; it is wide open to programming on any of the standards 70cm and 2m frequencies available to Ham operators, plus a whole lot more! 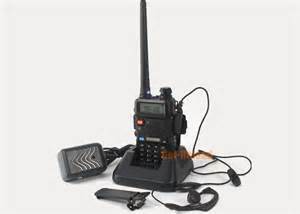 It can also be programmed for all the NOAA, FRS, GMRS and MURS frequencies for use during emergencies. This is a true dual-band radio as well. You can monitor 2 frequencies at the same time, even frequencies on different bands. The LCD screen clearly displays the frequencies or channel names. And switching between the two frequencies is very easy, push one button. At under $30 per radio it is an unbelievable bargain. Easily affordable for each member of your family or group. The handheld radio is a micro-miniature multi-band FM transceiver with extensive receive frequency coverage, providing local-area two-way amateur communications along with incredible monitoring capability. Full height two-color LED definition display. The screen has exquisite clarity. 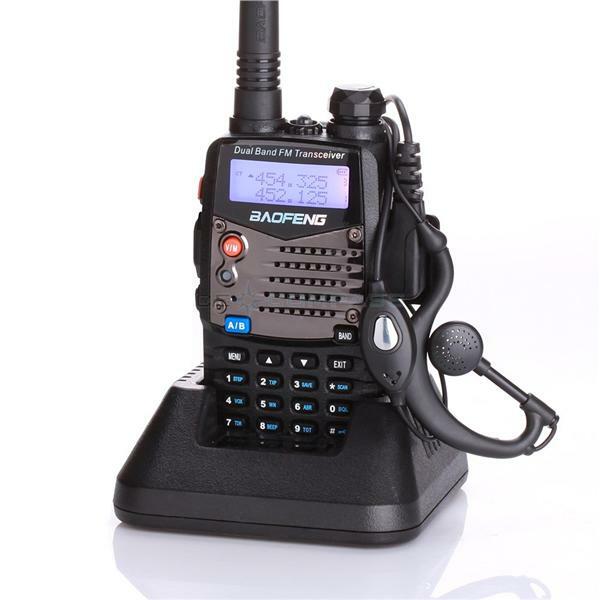 The Baofeng UV-5RA is a compact F.C.C. Part 90 hand held transceiver providing 4 watts in the frequency range of 136-174 MHz and 400-480 MHz. It is a compact, economical handie-talkie (HT) that includes a special VHF receive band from 65 – 108 MHz which includes the regular FM broadcast band. Dual-monitor and dual-reception is supported. You get up to 128 memories that are programmable from the keypad or via programming software. Selectable frequency steps include: 2.5, 5, 6.25, 10, 12.5 and 25 kHz. RF power may be selected at 1 or 4 watts depending on your field needs and battery life requirements. drop-in charging tray with AC adapter (8.4V 600mA). I loved this radio as soon as I took it out of the box! There is a “feel” to it that just gives that impression that it is a decent quality little radio. It doesn’t quite compete with my Yaesu FT-60R but my 60R was also SIX TIMES more expensive! From a fully functional, field utility perspective, the UV-5RA competes just fine with the 60R. And I would rather every member of my family have a UV-5RA than only one member of the family have the better quality, far more expensive, Yaesu FT-60R. I did some field programming from the keypad and it is OK but would be tedious and challenging to try and do to much of it without a manual right there and plenty of patience. I use the RT Systems software to program the UV-5RA. The RT Systems software works perfectly, easy to use, dependable, and I love the support from RT Systems folks if you ever have a question. Turned it into a vehicle based mobile radio with improved range. Made a “mini-communications” center with it with way better antennas for improved range. Increased its battery life by adding a 3800 mAh battery to it. Added a AA battery tray to it making it more versatile with alkaline or rechargeable batteries. Made it independent of internal power with a 12vDC adapter cord. 14.5″ dual-band antenna – Significantly improves operational range and quality of reception. Vehicle external antenna & connector/adapter cable – Allows the radio be operated from a vehicle with considerably more transmit and receive range. Speaker Microphone – Makes radio operation in many circumstances way more convenient, especially during vehicle operation in conjunction with the vehicle external antenna & connector/adapter cable. Programming software & cable – This is an absolute must as far as I am concerned to allow this radio to become fully functional for you. It opens up a whole lot of capability and “usability” for you. “BUY” this radio and you won’t ever regret it!